YoungsRPS, which offers a broad spectrum of management and professional work in rural, development and commercial fields, has announced the appointment of Matthew Wallace. This appointment is the latest development for YoungsRPS, which is seeing an increased demand for its services. Joining as a full-time Rural Surveyor, Matthew will be based at the company’s Head Office in Hexham. In taking up his position Matthew joins a team of 18 highly qualified rural practitioners who are committed to supporting rural businesses across the North of England and the Scottish Borders from their five regional offices. 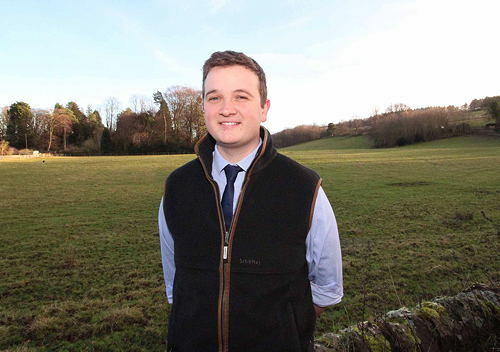 Matthew, who has a proven track record in rural surveying, was brought up on the family farm near Haltwhistle, and he continues to be involved with all aspects of hill farming. He graduated from Harper Adams University with a BSc (Hons) Rural Enterprise and Land Management. He is a Member of the Royal Institution of Chartered Surveyors (MRICS), and a RICS Registered Valuer, as well as a Fellow of the Central Association of Agricultural Valuers. His new role with YoungsRPS will be to support Robbie Hutchinson with the management of rural and semi-urban estates across Northumberland. He will undertake valuation work, conduct and conclude negotiations on behalf of clients, prepare farm budgets and cash flows, as well as completing business appraisals. In particular, Matthew will support farmers with their agricultural subsidies, updating them with the latest information in relation to the Basic Payment Scheme, environmental and other grant opportunities. He will also advise on landlord and tenancy issues including rental negotiations and succession applications. Outside of work, Matthew, a former student of Haydon Bridge High School, is well known within the farming community. He is the current treasurer of the Northumberland Young Farmers Northern Area Field Day, an active member of Haltwhistle Young Farmers and a Member of Gilsland Agricultural Show Society. Specialists in all aspects of farming and land management, YoungsRPS also has a planning department and specialist residential, commercial and farm sales agencies.